When the attacker realises that he is unable to stay on the inside on the defender's turn, he relaxes his angle of bank a little, then pulls high. As he comes over the top he is inverted, looking down at his opponent through the top of his canopy. His speed falls due to the climb, and this disminishews his radius of turn. The 1g of gravity is utilized by turning in the vertical plane, which reduces the raidus of turn still further. The attacker sholud the be well placed to slide down into a fireing position. The high-speed yoyo is a very difficult maneuvre to preform well, and demands perfect timing and precise execution. If it is commenced too early, the defender can counter by pulling up into the attack. 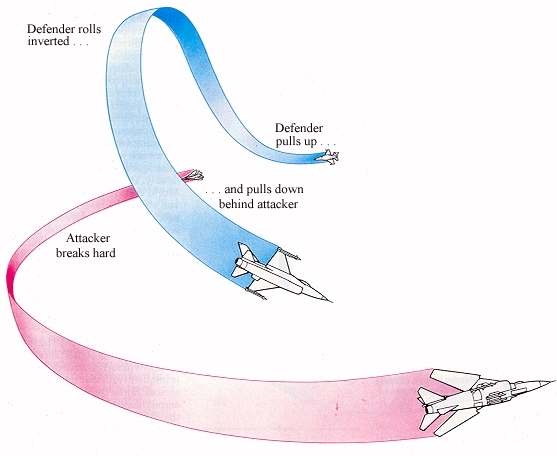 If started too late, the attacker is forced to pull up at an excessively steep angel to avoid overshooting. This allows the defender to disengage by diving away. A common fult in executing the high-speed yoyo is not pulling the nose high enough. This can result in the attacker ending dircetly above the defender. Some pilots find that they can obtain better results from a series of small yoyos than one large one. A variant on this maneuvre, used to prevent overshooting or to reduce the angle-off is the rollaway.